Population Growth and the food supply | Watts Up With That? As we will show below, there is no indication of a change in the rate of increase in crop yields in the United Nations FAO data. They include the phrase “without adaptation” in their prediction. Since the developing world is adopting the farming technology of the developed world, especially irrigation systems, hydroponics, fertilizer and farm machinery at an accelerating rate, this is a good CYA if their predictions fail. We will also discuss the trends in human population growth. Ever since Thomas Malthus published his theory of population growth in 1798 there have been large groups who believe that man will breed himself into starvation by consuming all of the Earth’s resources. We’ve had over 200 years to prove him correct, but instead today with a population of 7.2 billion, versus the 1798 population of around 800 million, we have more food per person and a smaller fraction of malnourished people than in 1798 as we will show in this essay. As recently as 1968, Paul Ehrlich published The Population Bomb which predicted, among other things, that hundreds of millions would starve to death in the 1970s and that England would not even exist in in the year 2000. He also warned that the world as we know it will cease to exist before 1985. Well, just like Malthus, Ehrlich was comically wrong. 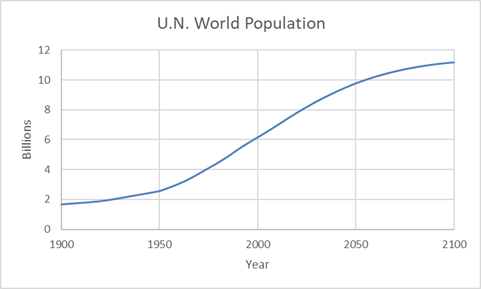 “As you can see in Figure , the massive growth in the world’s population began around 1950 and will probably end around 2050. The increase in the population is mainly due to a dramatic fall in the death rate as a result of improved access to food, medicine, clean water and sanitation. The increase is not, on the other hand, due to people in developing countries having more and more children. In the early 1950s women in developing countries gave birth to an average of more than six children – compared to an average of around three today. As [UN Consultant Peter Adamson] put it, rather bluntly: “It’s not that people suddenly started breeding like rabbits; it’s just that they stopped dying like flies.” Lomborg, Bjørn. The Skeptical Environmentalist: Measuring the Real State of the World (pp. 45-46). “In a traditional agricultural society, income is low and mortality high. However, children working and providing for their parents in old age generally supply greater benefits than their cost, and therefore the birth rate is high. With improved living conditions, medicine, sanitation and general economic prosperity, the death rate falls. The transition towards a more urban and developed economy makes children more likely to survive while they start to cost more than they contribute, needing more education, working less and transferring the care of their parents to nursing homes. Consequently, the birth rate drops.” Lomborg, Bjørn. The Skeptical Environmentalist: Measuring the Real State of the World (p. 46). 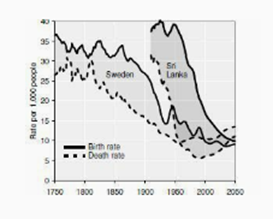 In figure 2 the death rate falls first and then the birth rate. In figure 3, we see the U.S. Census Bureau estimates of world population growth in absolute terms and in percent. In absolute terms the growth rate peaked in 1990 at 87 million people a year, it fell to 83 million by 2016 and the rate of population growth is currently 1.12%, down from over 2% in the early 1960s. It is expected to continue to fall and is projected to be less than 0.1% in 2100. It is silly to blame population density for a poor quality of life, since the population density of Southeast Asia is the same as in the U.K. The problem with the quality of life in Southeast Asia is not population density, it is poverty. As the modern industrial era began in the early 1900s, life expectancy increased quickly. Similar improvements occurred in the developing world, although they began later. By 1950 the developing world had a life expectancy of 41 years, it improved to 65 by 1998. 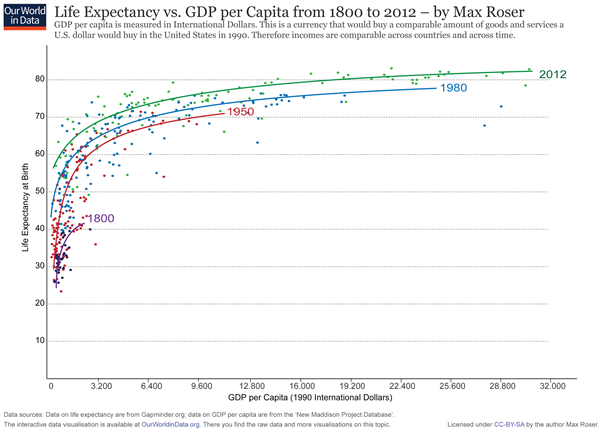 Life expectancy has improved over all, but always correlates with income, see figure 4. “Professor David Pimentel of Cornell University is a frequently cited and well-known environmentalist, responsible – among many other arguments – for a global erosion estimate far larger than any other … and for arguing that the ideal population of a sustainable US would be 40–100 million (i.e. a reduction of 63–85 percent of the present population).” Lomborg, Bjørn. The Skeptical Environmentalist: Measuring the Real State of the World (p. 22). According to worldhunger.org, in 1990 there were one billion malnourished people in the world (18.6%) and in 2014 there were 794 million (10.9%). A reduction in the number of malnourished, even though the total population had increased to 7.2 billion in 2014 from 5.3 billion in 1990 (36%). According to UNICEF, the number of stunted children has decreased from 254 million in 1990 to 155 million in 2016. The number of overweight children has increased from 32 million to 41 million. There is no evidence that the population needs to be decreased. The last major attempt to decrease a population was in China, it has since been rescinded and China has dramatically reduced hunger and malnutrition by using modern technology, trade, and fossil fuels. The life expectancy at birth increased from 40 years to 70 years between 1950 and 2000. This is due to a reduction in disease and in infant mortality, as well as a decrease in malnutrition. China has decreased malnutrition from 24% in 1990 to 9% in 2016. Child malnutrition has dropped by over 70%. “Stories of how global warming will “greatly increase the number of hungry people” and of how we are facing “catastrophe” with “whole regions becoming unsuitable for producing food” abound.” Lomborg, Bjorn. Cool It (Kindle Locations 1549-1550). “The battle to feed humanity is over. In the course of the 1970s the world will experience starvation of tragic proportions – hundreds of millions of people will starve to death.” … Ehrlich runs down what he calls the “professional optimists”: “They say, for instance, that India in the next eight years can increase its agricultural output to feed some 120 million more people than they cannot after all feed today. To put such fantasy into perspective one need consider only …”, and Ehrlich presented a whole list of reasons why this could not be achieved. And sure enough, it turned out that the figure of 120 million did not hold water. Eight years later India produced enough food for 144 million more people. And since the population had grown by ‘only’ 104 million, this meant there was more food to go around.” Lomborg, Bjørn. The Skeptical Environmentalist: Measuring the Real State of the World (p. 60). Dr. Craig Idso and others have collected evidence that net primary plant productivity has increased over 20% since 1961 (see here). This is in addition to additional crop productivity due to technology. Much of this growth in productivity (perhaps 70%) has been due to increasing CO2, some is due to the increase in arable land and a longer growing season due to warmer temperatures. Dr. Idso, and others, have estimated that the monetary benefit of rising CO2 on global plant production is $3.2 trillion from 1961 to 2011. “… food availability has increased dramatically over the past four decades. The average person in the developing world has experienced a 40 percent increase in available calories. Likewise, the proportion of malnourished has dropped from 50 percent to less than 17 percent. The UN expects these positive trends to continue at least till 2050 with another 20 percentage points’ calorie increase and malnourished dropping below 3 percent.” Lomborg, Bjorn. Cool It (Kindle Locations 1552-1556). The world now has 800 million malnourished people. This is projected to decrease to 108 million by 2080, if global warming has a negative impact, as it does in some pessimistic forecasts, there would be 136 million malnourished in 2080. This is still many fewer than we have today and in 2080, the population will be much higher than it is today, so the malnourished population, as a percent of the total population, will drop even more (Lomborg, Cool It). How many malnourished people we have is not very dependent upon climate, it is mostly a matter poverty, war and transportation of goods, especially food. 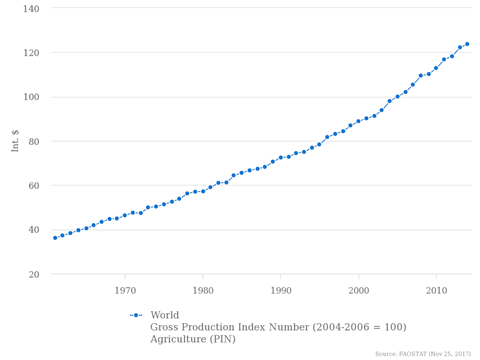 World agricultural production has more than tripled since 1961 (figure 5) and the increase is more than 4 times in developing countries (figure 6). According to the U.N. we produce 23% more food per person than in 1960 (FAO). The FAO has recently announced that cereal production has reached a new record in 2017. 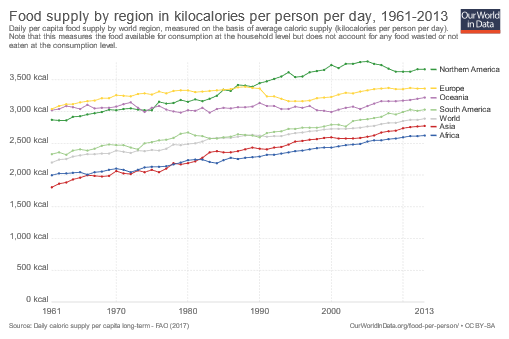 As food production rapidly increases around the world, the number of calories (technically kilocalories) each person has available (figure 7) is also increasing. 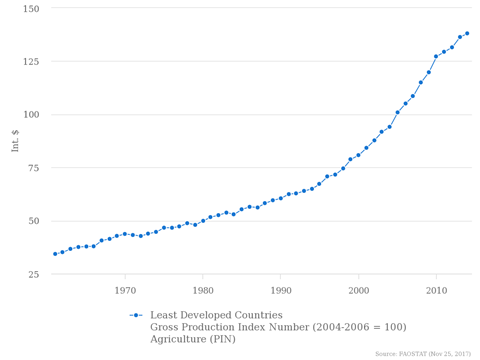 Even in Africa and Asia, the available food supply has increased dramatically since 1961. “Each time our investment in climate saves one person from hunger, a similar investment in direct hunger policies could save more than five thousand people.” Lomborg, Bjorn. Cool It (Kindle Locations 1618-1619). Given the data presented in figures 5 and 6 one might think they are they saying that the effect of climate on crop yields is insignificant. It seems very likely that crop yields will continue to increase, if climate is a negative effect, it must be very small. 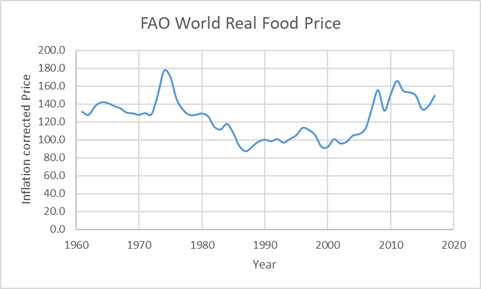 Figure 8, FAO Inflation corrected World food prices. World food prices (figure 8) are up since about 2005 when biofuels, especially corn ethanol, took off (see figure 9). The production of ethanol consumes 40% of U.S. corn. The World Bank discusses the reasons for higher prices here. The article was written just after the food price peak was reached in 2012, which corresponds with the flattening of corn-based ethanol production (figure 9). The causes were mainly biofuel production, poor weather and increasing demand for grain in Asia to be used for livestock feed, as Asian consumption of poultry and meat has increased. Prices have fallen since 2011 when they reached their peak. Biofuel production flattened in 2010 and as farms increased their production to meet demand. The increase in food production and decreasing food prices are mostly due to improving agricultural technology in the developing world. But, some of the increase is due to additional atmospheric CO2, which acts as an airborne fertilizer and to global warming, especially in Siberia and Canada, where it has opened more land to farming (see AR5, here). This has contributed to the boom in agriculture in Russia. Most of recent global warming has occurred in Canada and Siberia, which has helped farmers in those areas, see figure 10. Lomborg wrote the following in 1997 and it was true then. What he did not know at the time was that biofuels would explode onto the scene and humans would foolishly burn their food as fuel by heavily subsidizing corn and sugar ethanol. This had the obvious effect of raising food prices around the world and delaying the reduction of food poverty. “At the same time as the Earth accommodates ever more people, who are making demands for ever more food, food prices have fallen dramatically. In 2000 food cost less than a third of its price in 1957. This fall in food prices has been vital for many people in the developing world, especially the many poverty-stricken city dwellers.” Lomborg, Bjørn. The Skeptical Environmentalist: Measuring the Real State of the World (p. 62). “The fall in the price of food is a genuine long-term tendency. The price of wheat has had a downwards trend ever since 1800, and wheat is now more than ten times cheaper than the price charged throughout the previous 500 years.” Lomborg, Bjørn. The Skeptical Environmentalist: Measuring the Real State of the World (p. 62). The AR5 WGII report rather inexplicably reports that the impact of climate change reduced agricultural yields 1960 to 2013, see figure TS.2E, page 43. This is at odds with yield data from the United Nations FAO (figure 11). The ourworldindata.org web site plots FAO crop yield data that shows yields increasing all over the world, not falling. 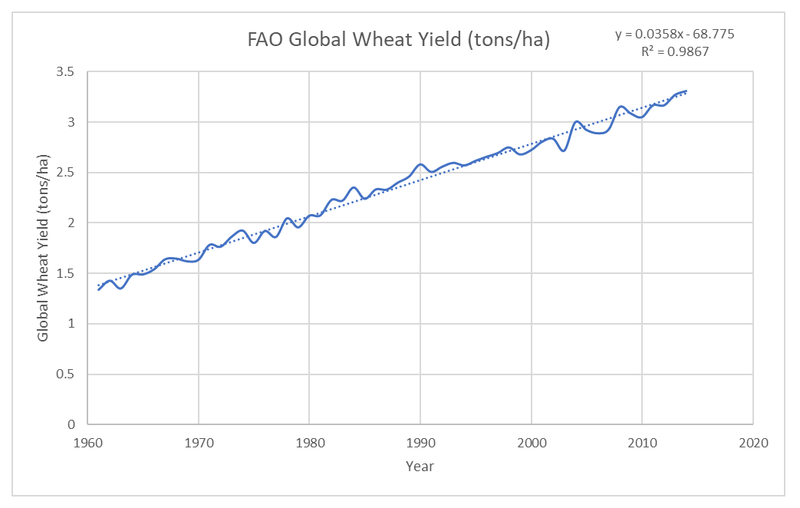 Figure 11, as an example, plots total wheat yield from 146 countries from 1961 through 2014, using 2017 FAO data. Figure 11, plot of total wheat yield from 146 countries, data from FAO (2017) and Ourworldindata.org. Yields are increasing 4% per year from 1961 to 2014 and the observed increase is very linear. Total food production is also increasing, and the rate of increase is increasing as can be seen in figures 5 and 6. The IPCC WGII conclusions are model-based and show very tiny “negative climate caused” changes of up to 2%/decade, see figure 12, this figure is from chapter 7, page 492 of the full report. Based on the data “medium confidence” seems to be an exaggeration. Further, spending many pages discussing their “modeled result” and not one word on the fact that yields are, in fact, increasing at a rate of 2% per year is disingenuous. A Mathusian or Erhlichian food catastrophe seems highly unlikely in the foreseeable future. Food production is growing rapidly due to the spread of western farm technology, CO2 fertilization, and new arable land in Canada and Russia due to global warming. The additional food is being distributed worldwide as the number of kilocalories of food available to people worldwide is increasing dramatically. Although IPCC models show that climate change should be decreasing crop yields, the data show no slowing of growth in yields. Although the world population continues to increase, the number of people being added to the population each year is decreasing. In addition, the rate of population growth has been decreasing since 1963. The peak growth year in absolute numbers was 88,000,000 in 1989 and it is still decreasing. Both numbers are expected to be near zero in 2100. The growth increased due to the average life expectancy increasing, due to a falling death rate. The birth rate then began to decline as the population became more urban and children became less valuable as workers and for security in old age. That is, the cost of raising a child increased and the benefits of having children decreased. As the world becomes more prosperous and urban this trend will continue. Human prosperity is the key to a better world. December 11, 2017 in Climate News, social cost of carbon. This is a great summary. You’ve demonstrated very eloquently the two worlds of climate science. One measures the output of computer models and finds only bad news, one measures the real world of human ingenuity, natural responses to changing human circumstance, and the resilience of the natural world to continual change. One uses pessimism to drive fear, and one uses real observations to support optimism. People need only decide if they support facts or fiction. Agree this a great post and shows a basis for the optimism many people feel. Andy May thanks for a great post. Andy Pattullo thank you for pointing out the triumph of facts and optimism over speculation and fear mongering. This series would make a great book. Unfortunately, probably the vast majority of people think of climate models as a certain expression of a science that is settled and backed by 97% of scientists. In reality they are just computer programs created by people who are pursuing an agenda of “saving the world”. The models are no more than opinions that have largely turned out to be hopelessly wrong. 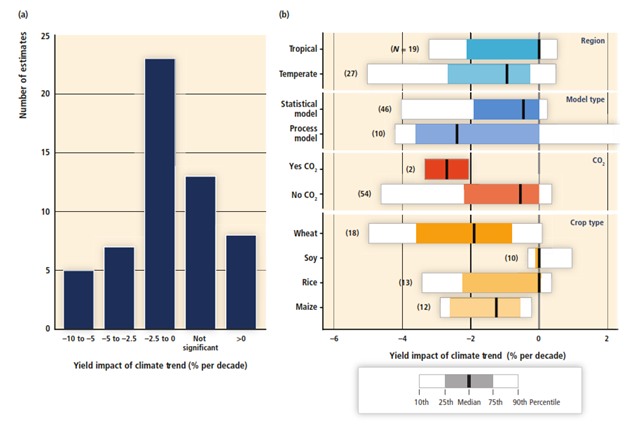 As described above, the computer models – what a surprise – showed a negative impact of global warming on food. The IPCC referred to this while apparently ignoring the real-world data. In my humble opinion, what the IPCC and their followers are doing is close to criminal. Many thanks for an excellent summary. It is a cause for hope. Of course, there are plenty of real problems in the world. Maybe the biggest is climate change. 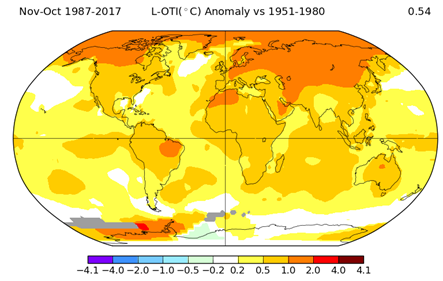 Not the climate itself, obviously – I’m quite sure the modest warming we experienced in the last century has been a great benefit. More specifically, it’s climate alarmism that is the real threat. In the long run I’m absolutely confident that the world will eventually see climate change for the ruinous scam that it is. But I’m not holding my breath. “Dont panic: The truth about population” by professor Hans Rosling. Even in poor countries, most population growth is coming from extending life expectancy. Even if birth rates all across the world were to drop to replacement levels tomorrow, the total population would still continue to grow for several decades. Given his history of failed prognostications, there are two reasons people still believe Paul Ehrlich’s crap. 1 – He’s a heck of a salesman. 2 – People are desperate to believe. Julian Simon pointed out that humans expend to fill the space available, and then use their ingenuity to increase that space and make life better for themselves. This is an active process. They don’t just sit there and suffer life becoming worse. Because of education, technology, and fossil fuels, things have changed. Malthus could not have foreseen that. Folks like David Suzuki should know better though when they echo his doom and gloom. Dodgy, your comments about ingenuity I like, and there is another aspect to Mays article. Has any of you flown in a small plane over the northern part of Canada/Alaska? The amount of available space is unimaginable. How about walking across the Sahara or Gobi deserts? So, doesn’t matter if the earth warms up or cools down, there is room to expand. Water? Desalinization with nuclear plants. Crazy Socialists? Can’t help you there. OK – expAnd rather than expEnd. When will we get an editor? The editor works great, you can fix all your errors before you hit the “Post” button. But most of us do not like to do it that way. The errors always show up better after the comment posts. As a side note, sometimes people here complain of the difficulty posting comments from their cellphone. I can understand that. I use a keyboard for my comments, and it works great. Just like cellphones are lousy for comments, I tried using my keyboard for making a phone call, and it did not work worth a damn. My “rule Of Thumb” is to use a phone for making calls, and a keyboard for posting comments. Works for me. Yeah, it does seem like errors are more noticeable in the final page view, and one wonders if the difference in font/size might have something to do with that . .
An editor would be nice, but just having the ability to delete your own posting would be adequate. I’ve seen it elsewhere–it works fine. You notice your spelling or whatever error just after posting, so you copy the text and then delete the posting. Then you paste the text into a new post or reply and fix the error, and then click the Post button. Easy, and relatively low system requirements. Commentators could then alter there original comment. Thus leaving replies looking out of place or foolish, depending. I used to get that when using Disqus, and some true believer changed the context of the original comment trying to make me look like a bit of a nitwit, while they extricated themselves from error in their original comment. It is difficult to explain, based on CO2, why warming should be concentrated in the Arctic, particularly the inland areas of Canada and Siberia. Until we have our arms around this phenomenon, it seems unwise to count on continued booming agricultural productivity in these regions. This was my thought as well. It can’t be a polar phenomena, the Antarctic is getting cooler. So much for “global” warming. Most of the global anthropogone contribution, albedo change etc. 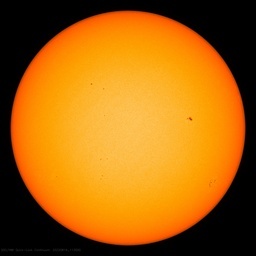 not CO2, is on the northern hemisphere dissipating in a northern direction. Canada and Russia/Siberia are at higher latitudes. It stems from the fact that since the poles are cold, so that the air at the poles can hold very little water vapor. To a large degree water vapor and CO2 absorb many of the same frequencies of photons. When there is a lot of water vapor in the air, there is little left for CO2 to absorb. As a result of this, the places where more CO2 will make the most difference, is at the poles. In other words, CO2 makes really cold places a teeny bit warmer and has almost no measurable impact on places that are already warm. What you say is true, but as Andy pointed out, the south pole is not experiencing warming. The science is actually settled……………..that is regarding the law of photosynthesis and the effect of beneficial warming to world food production/crop yields. 2015………..Records for world food production!!! 2016………New records for world food production!!! The last 4 decades have featured the best weather/climate and CO2 levels for life on this planet since at least the Medieval Warm Period. Let us remember the anti-Malthusian economist Julian Simon, who wrote a book — “The Ultimate Resource”. Simon held that every mouth comes with a brain and a pair of hands, and that the ultimate resource is the human imagination. 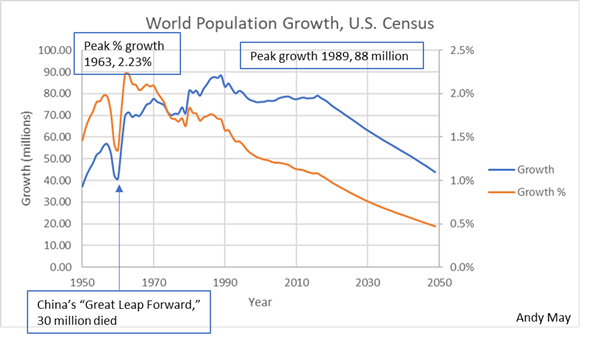 The end of population growth by births (not immigration) in the industrialized world shows that we have formula for ending the Malthusian problem: prosperous industrial economies, and educated women. Let us spread that formula across the world, instead of the fear of a colorless, odorless, non toxic, trace gas, that is absolutely necessary for life on this planet. For sale: Grauniad affiliate brain. Never used, still in it’s original box. But they lack sufficient spine to stand up for themselves. Personally, I prefer fewer people. But then I am rather an anti-social SOB. However, I don’t see much of a problem with current populations and the world can probably support significantly more people with current climatic conditions and even with increasing warmth. On the other hand, Just a bit of cooling or a reduction in CO2 levels could rapidly impact our ability to feed our population. I tried to copy a graphic here that hints that we are slowly descending into another ice age. It didn’t work, but you can find it on my site. It was initially sourced from the Journal of Quaternary Science and uses data from sediment cores taken from the Bering Sound. Thanks! The artist is Wiley Miller. 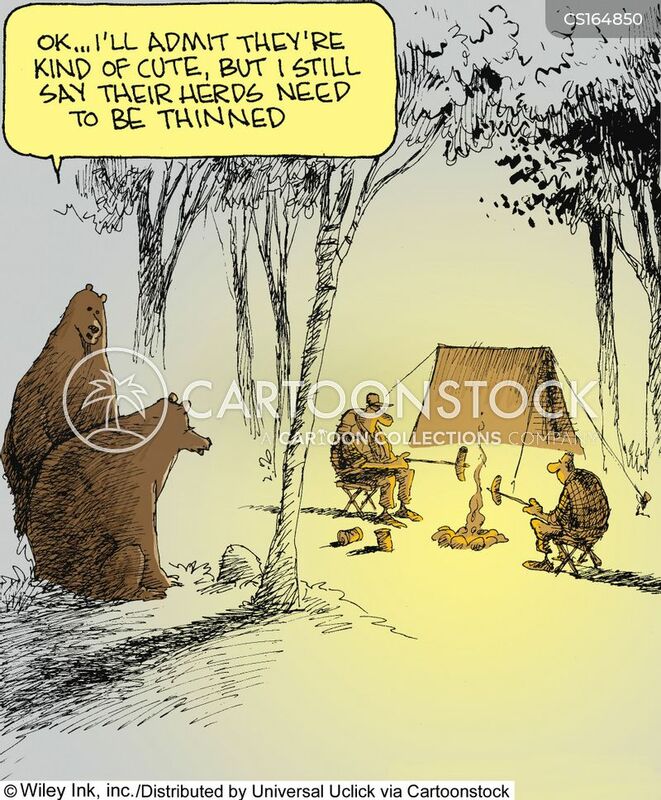 Maybe the brown bears in the cartoon need to be replaced by polar bears. It is quite well established that increases in CO2 will likely have the greatest effects on temperature where water vapor is least. Arctic and sub-Arctic regions are areas of reduced overall water vapor concentration, so the ‘greenhouse’ effects of the gas are expected to be more pronounced. December 11, 2017 at 8:41 am: Not working down at Antarctica! Measurements are only made far fron the North Pole. Extrapolations used are false, especially when energy content of 1deg at a pole and at the equator are compared. I have had shown to me how the warmer winds replacing freezing winds towards the south (as is happenning now), release their energy upwards to space. The ice warms not, and all stays far below freezing untill summer. Like almost all socio-economic topics, population growth is a LOCAL issue — almost entirely. Like Sea Level Rise, Climate Warming, Air pollution, agricultural chemicals, etc, population growth and sustainability of populations depends on WHERE and WHEN you are talking about. Runway population growth is not occurring in the developed world — it is a phenomena of the under- and undeveloped world. This means that, importantly, there are lots of children being born in places that can not properly provided for them even basic human needs — food, clothing, protection from the weather, education, basic medical care. Increasing population in these areas makes it necessary to spread precious, inadequate resources even further and thinner. I have seen this (heartbreakingly) firsthand in the poorest and remotest areas of the Dominican Republic and neighboring Haiti. This trend can be and is truly disastrous when what should be minor social disruptions occur — bad weather, a droughty summer, strong wind-storms, social unrest. In the poorest areas, these disruptions lead to famine and starvation — abandonment of young children and the elderly, families being broken apart as fathers travel to seek employment in hopes of sending money home (which seldom arrives). In the DR, as my wife and I traveled to and from humanitarian projects in the hinterland, we could always tell where the worst of poverty and hunger had struck — a village would be without a single chicken or dog wandering the streets. Just because the Global Statistics don’t show the horrors of population booms isn’t a Global Problem doesn’t mean that it isn’t happening in many places and can be ignored. When a local culture is collapsing under its own weight due to local over-population, outside humanitarian help is urgently needed to prevent unnecessary suffering. Ehrlich-ism is a false Cult of Doom — but local and regional over-population can not be ignored. I agree. The best way to help the hungry is to help them become more prosperous. Unfortunately they are often poor because of corruption and/or war. Both can only be solved by toppling governments, and we have not done that well. Andy ==> That’s what the United Nations was intended to do….prevent human suffering by eliminating sociopathic/psychotic governments and their leaders — kicking out kleptocrats, freeing people from the oppression of their own governments. On this particular score, the UN is a total failure. Where on Earth did you find that the United Nations was intended “prevent human suffering by eliminating sociopathic/psychotic governments and their leaders — kicking out kleptocrats, freeing people from the oppression of their own governments.” ? Those problems are more due to “poverty” than they are to “local over-population.” And industrialization and CO2 emissions are the solution to such “problems,” not the cause. So aside from pointing out micro vs. macro population tragedies, I don’t know what you’re driving at. AGW ==> If you haven’t had the personal experience, it is hard to communicate with you about it. Poverty is not simply a lack of money, profound poverty is a cultural phenomena — a family that owns literally nothing with one child can often cope — by the time the fourth child arrives, their situation can be hopeless — there is simply no way they can feed and cloth and house everyone. When the entire society around them is suffering in the same way — their neighbors too are struggling to feed too many mouths from too small a garden plot — their is nothing to spare and nothing to share. The local health clinic, supported by foreign charities, keeps everyone alive, but not healthy. Just when they’ve had a good crop and are getting a handle on things, another child arrives, absorbing the time and effort of the mother, eliminating her small earning ability, and they family is back on hard times. Whole countries exist as above — with the exceptions of some parts of their big cities where the educated live in high-rises with self-contained 24/7 power and water. Land is the key for these people — if they had land of their own and the weather co-operates, they can work hard and feed themselves and have a little to sell. Comes a poor rainy season, or a militia moving through stripping the land of the crops to feed itself and the family is starving once again. In most of these countries, the good land is owned by the rich and little arable land is available to the poor. The formula is simple : Too Many People and Too Few Resources and Too Few Opportunities. Add any disruptive element at all and the society collapses into desperate families scrabbling for anything to eat and/or sell for food. We can’t cure poverty by sending money or LED/solar powered lights for mud-floored huts. Kip, if that was all there is too it, then the world would still be poor. Our ancestors worked their way out of poverty even while having 10 or more kids. It’s only in the rich world that kids become net drains on resources. agree completely. Population increases are taking place where the people are least able to cope with them. John ==> You speak correctly of today’s failed UN and today’s corrupted UN. There was once an idea that was worth pursuing — it has been left a shambles of political intrigue and infighting — only small portions of the UN actually accomplish any good. I have worked successfully with the WHO/PAHO in the DR to bring about a lot of good…. Dipchip, you are correct. I fixed it. Generally cheering article. There are, however, organized efforts to disrupt the food supply–anti-GMO activism and the associated “organic” food movement. I wonder if Andy has heard that association is not causation? Since there are many good explanation and Andy sometimes does good research, maybe Andy has an agenda. When people with an agenda make misleading statements, they should check to see if their pants are on fire. In general when it comes to food and energy, supply equals demand. Food and energy are extremely cheap commodities. Feed corn was so cheap around 2005 that some used corn in pellets stoves. There is an energy component to feed corn. My senior project as a mechanical engineer at Purdue was to investigate using waste heat from from power plants to dry corn. Corn was rotting in Indiana at the time because of the shortage of natural gas. Also at that time, a population equal to the US was joining the middle class in China. Had a wonderful pork chop in a ‘Chicago’ style restaurant in China. Growing up in the midwest we called German cooking. It is hard to find a seat in an American restaurant in China. Sometimes, they don’t get it right, like San Francisco famous lobster not Maine. In SF we would eat Chinese at the corner of Grant and Washington. Alaskan King Crab down at the docks. Burning corn is a wood stove destroys the plant protein. Ethanol preserves plant protein for animal feed. Corn ethanol does not reduce the food supply. You’ve got to be kidding. Corn based ethanol is mandated by the US government as a gasoline additive, and 40% of the US corn crop is dedicated to ethanol production, and you don’t think this “reduces the food supply? !” Oh, and did you not hear about the food riots caused by the spike in corn prices (which was directly related to “biofuel” BS)? And you don’t think that having a government mandate on ethanol, and the resulting “guaranteed” market for corn, encourages corn to crowd out other food crop production?! When all “ethanol/biofuel mandates” are removed, see if the price of corn doesn’t go down. Of course, the entrenched interests are unlikely to let that happen. If there’s “many good explanations,” perhaps you would care to elaborate…sounds like BS to me. Not true! I have read the 2005 Energy Bill. I have seen no evidence that those who disagree with me have bothered. The is a small mandate for renewable sources of transportation fuel. We now have ethanol prices higher than gasoline, which is stupid because ethanol only gets 2/3 of the miles per gallon that gasoline does and it harms our engines. Well, sounds like perhaps you missed the revision to the 2005 bill, which in 2007 raised the amount mandated from 7.5 billion to 36 billion gallons by 2022. Personal insults or accusing me of having an agenda, are not conducive to a scientific debate Kit. Let’s keep it a civil fact and logic based discussion please. Any time you reduce production of something, the price rises. That was one of the attractions of the ethanol scheme, or so my farmer friends here in corn country tell me. Although many of them think corn prices are still too low. These are the same ones that recently bought brand new harvesters and outfitted all their fields with irrigators. Actually you inferred it, which I I had to infer your pants on fire. Andy you can find anything on the internet. Does not make it true. Maybe you should stick to subjects where you know you are telling the truth. Second it you do not want folks to disagree with your BS, avoid posting on the internet. Andy is using flawed logic. Association is not causation. On the other hand, he is making a rational inductive case and as Mr. Penrose points out, demand impacts prices. Now with regard to ethanol in U.S. gasoline, this was brought about by associated lobbyists and involved in the various Clean Air Acts, Reformulated Gasoline and more recently Renewable Fuel Standards. Mr. May is covering a lot of ground. I find some things peculiar as perhaps you do. But this is only part 2. Is there some place where you find agreement with him? Food grade Corn is generally Sweet Corn. The most popular Corn at Farmer Markets is usually Sweet Corn. Corn grown for Feed or Ethanol is Field Corn. Field Corn prices are based on Chicago Board of Trade prices. Sweet Corn is an entirely different Market. It would be Rare thing for a farmer to replace growing Sweet Corn for Field Corn because of Influence of Ethano because of the Economics. Sweet Corn is more Profitable, but the Access to the Market is Limited. Again, the Market for Sweet Corn is entirely different than the Market for Field Corn. Back in the early 1970s, I had planted a large garden one year, where I grew sweet corn and also some field corn for my neighbor’s several horses. One day the horses got into the garden. They ate every bit of the sweet corn, and did not touch the field corn. Rare? Not in Minnesota and Iowa. I personally know farmers that made the switch because field corn prices are more stable, due to the ethanol blending mandates and subsidies. I completely agree on the basic premise of the article. We have been very successful in increasing our food production, and there is still a lot of room for improvement. In the worst case we could reduce the number of cattle we raise for meat, but it might not be necessary. However although the global situation is good and we can produce enough food to feed everybody including the coming 2.5 billion more expected, the situation is not the same everywhere. Quite a few developing countries, specially in MENA and Africa, but some in Asia too, have huge rates of population growth, with very young population and no real capacity to increase their food production, and already heavy importers of food. Some of those countries are ticking bombs waiting for a disaster. What happens if for example Saudi Arabia starts producing less oil? What happens if the price of food increases? The Arab spring was actually the product of a spike in oil and food. The people in these countries spend a good part of their income in fuel and food. A lot more than people in developed countries where an increase in food prices means little. Egypt is a disaster waiting to happen. Right now they are making it thanks to financial aid from Saudi Arabia in exchange for complete political alignment and some islands in the Red Sea. But their population is still growing fast and their means to pay for imported food are decreasing. The situation breeds radicals that attack the touristic income making it worse. It is just a question of time that their situation becomes so much worse as to plunge the country into armed infighting in a situation as bad or worse to what happened in Algeria’s civil war. Countries with falling growth rates however also face problems, like much of Europe and Japan. When Saudi starts producing less oil — not if. They pump more seawater into Ghawhar then they get oil out. Ghawhar is the basis for 90% of their reserves. Like Joe Rogan the comedian said “We don’t have a water problem we have a SALT problem”. We don’t have a food supply problem — we have a food distribution problem. 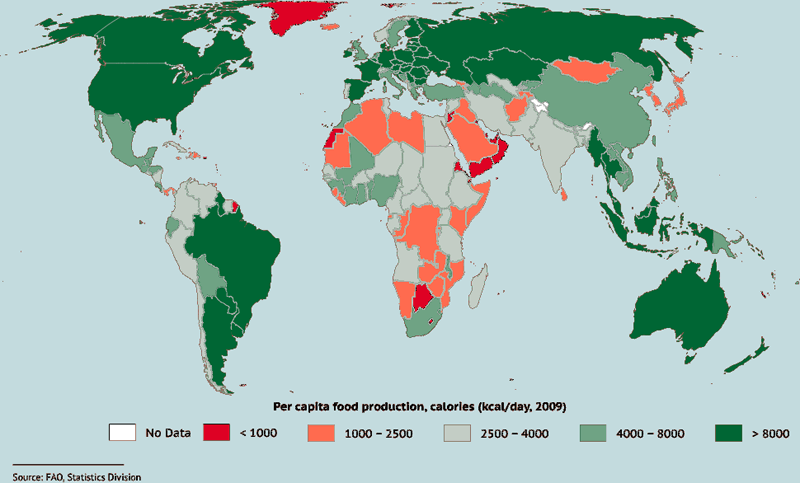 IIRC even with many fields lying fallow — the world produces 2700 kcal of food/day for every man woman and child. That is enough to support 9 billion people, especially considering at least 25% of the world’s population are obese (meaning they eat way more then they need to. Likely that part of the obesity problem is related to lack of exercise combined with eating junk foods, too many sodas, etc. It is also true that we do not have a water or salt problem, we have a water distribution problem. There is plenty of water, it is simply not evenly distributed. Some places have huge rivers dumping water into the ocean unused, while other locations not that far away have frequent shortages. We have huge floods every year that could more than make up for the droughts, if the water could be transported and/or stored effectively and in sufficient quantity. I have no doubt we can feed the world for the immediate future but there is still the issue of large numbers of people trying to fit into a fixed area. Riding the roads around LA or DC is a disaster. Public waterways and lakes, etc. are under stress. Go to the beach and spend a wonderful day with 20,000 sunlovers. It would be nice to keep the numbers down some just for quality of life. Funny thing, I have no problem finding beautiful beaches, lakes, rivers, ect. Even in China I had no problem taking a walk on the beach by myself. I could walk on the crowded road or go a few minutes out of the way. Here in Florida there are beaches that are always jammed with people, while other beaches a few miles away are empty. This occurs up and down the east and west coasts and the panhandle. I have never lived anywhere where one could not find some solitude with a little effort. And I have lived all over the eastern US and all over Florida. In Destin Florida, crowds pack the beaches in Miramar, and Destin Proper, in front of the Hotel and Condos, yet Henderson Beach State Park (literally a 5 min walk down the beach) is usually quite vacant. Deerfield Beach is always packed, but up the road on the south side of the inlet, is a park that is pretty sparsely visited. New Smyrna Beach and Daytona Beach are packed, while Cape Canaveral National Seashore is an unspoiled oasis and id frequently empty. Indialantic beach, packed, other beaches nearby, not. Same all up and down both coasts. Perhaps we should allow unlimited immigration of lawyers into the DC area. rbabcock, the problems you describe exist only in large cities. Large cities take up a tiny percentage of the world’s surface area. If large crowds bother you so much, move . 99% of the world isn’t so crowded. Don’t tell me the second half of rbab****’s name is what put me into moderation! It’s probably true that human ingenuity will be able to cope with population increases for some years yet. But at what cost? More and more land devoted to housing, and to crop production; less land available to non-human creatures; greater risks from natural and man-made disasters. Imagine if the world population were one-tenth of the existing 7 billion. We’d have resources to keep us going for ever. Population reductions are happening in some countries, if slowly. yet some people see nothing but problems in this – who’s going to look after the elderly? This is nonsense. Japan is showing the way. Robots will help do the work while the population ages. When the desired lower population is reached, and stability is reached…… but it won’t happen. The crunch is coming. This article shows why Bjørn Lomborg, despite being sold on global-warming, is so hated by the Greens. As one of their own, he points out incontrovertible facts which contradict the basic green “Cider with Rosie” philosophy. They believe it was better before the industrial revolution, and could be better again, but obviously without them personally having to do the work of 100 blacksmiths, 100 plough-horses, without sanitation or antibiotics, without somewhere warm to sleep at night…. the list is endless. As a heretic, Lomborg has, with great dignity, put up with an amount of abuse greater than most sceptics will have to endure. Good on the guy. Here’s Dr Hans Rosling using the available data to show human prosperity from 1810 to 2010. This video only takes 4 minutes to watch and shows the modern human miracle after the Ind Rev and the burning of fossil fuels. Just an incredible video that easily counters the extremist’s nonsense. In 1810 life expectancy was under 40 years of age, but today is about 70 years on average and in the first world is about 80 years of age. Today China’s 1.4 bn people have a life expt of 76 years of age and China now generates 66.7% of total energy from coal ( US just 17%) and just 1.6% from Geo+ Solar &Wind. Here’s Dr Rosling’s short video. 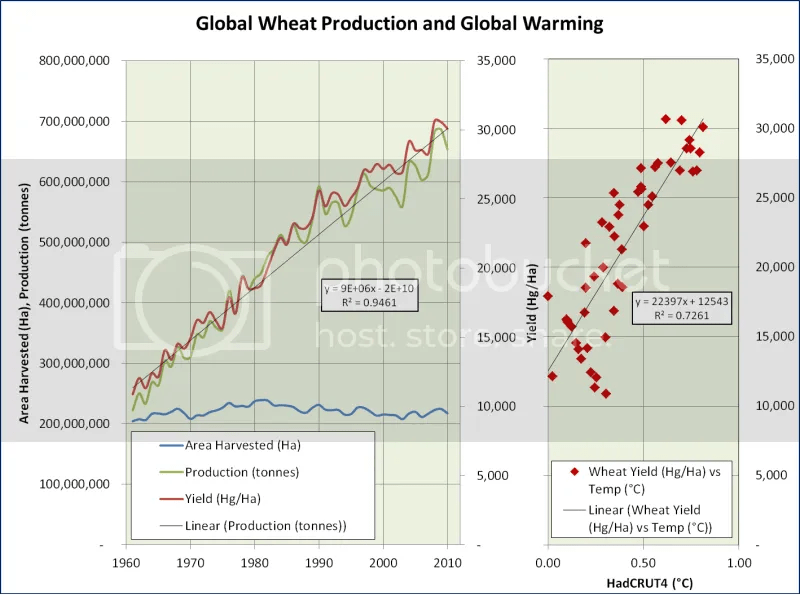 Their models probably indicated that without the additional warming and CO2, crop yields would have increased even more than they did, therefore, the impact of climate change reduced agricultural yields from 1960 to 2013… a claim that is unprovable and preposterous. Wheat yield and production have more than doubled over the past 50 years. In the state of Andhra Pradesh [known as rice bowl of India], the tradional paddy under irrigation yielded 1300 kg/ha , with high yielding seed this increased by 500 kg/ha [that is total of 1800 kg/ha] and by adding chemical inputs the yield level rose by 2000 kg/ha [that is total is 3800 kg/ha] under the farmers fields. The research farm yield is 5000 to 6000 kg/ha but the present average yield of farmers fields are 2600-2800 kg/ha. However, the mono crop culture of the so-called green revolution technology with new high yielding varieties grown under chemical inputs reduced the animal husbandry hither to play a prominent role at household food security as the fodder is not a good diet like the traditional ones. While calculating food production gains we rarely account this loss. Also, soil, water, air and food pollution and associated health hazards are not also accounted. However, the mono crop culture of the so-called green revolution technology with new high yielding varieties grown under chemical inputs reduced the animal husbandry hither to play a prominent role at household food security as the fodder is not a good diet like the traditional ones. While calculating food production gains we rarely account this loss. I can usually follow and always appreciate your comments, but – unfortunately – this one does make your usual logic. To be blunt, it is not clear. Please explain it further. Are you saying that, because less (animal) work is needed to grow the newer varieties of rice, less animal energy (food) is “lost” feeding the animals that used to be used plowing and harvesting and tending the old varieties of rice? Traditionally, farming system includes animal husbandry. Animal were used both as food and non-mechanised arming through animal [drought animal]. Inter-cropping provides the good fodder to animal. The traditional paddy fodder is good but the hybrid paddy fodder not so good — so the farmers are burning it.-. As the irrigated area increased, paddy cultivation increased. Animal husbandry disappeared and thus stable income gone down . Now, cotton, paddy, groundnut, etc farmers prefer to grow sole and no inter-cropping. We invariably tell them follow crop rotation so that animal husbandry will be part of farming system. But farmers least interested. This is successful with tobacco as the buyer refuges to purchage tobacco after tobacco cultivation. +1 You didn’t mention manure for fertilizing the field, but nowadays industrial fertilizers are more easy to use. Please stop your ciunter factual monotone. I don’t understand your problem. I am presenting the factual information. If you got a problem, please don’t read it. Excellent. It is long past time to call out the Malthusiam delusion. When will a definitive slamdown of the evil infkuence Ehrkich, Holder, Schneider, etc habe had on the world be written- and written well enough to get people to wake up? Probably never because doom sells. Human societies have been through doom so many times in history that one would have to be delusional, or at least a Panglossian optimist, not to acknowledge that it is bound to happen to our society at some point too. Also, Ehrlich, Holder and Schneider may have been clowns or Chaucerian frauds, but don’t knock Malthus. His arguments made a lot of sense and he would have been correct about the human predicament but for an unprecedented surge in technological innovation and increased energy and natural resource consumption. Well, the bad news is that the four horsemen are still out there just over the horizon, and it will take a continuing surge in technological innovation and yet more energy and natural resource consumption to keep them at bay. Last time I checked we were burning fossil fuels faster than nature was making them, so the current energy setup is clearly unsustainable over the long term. “Farmers are producing too much food, holding down prices and holding back economies in states with big agricultural industries. “South Dakota and Iowa are the only two states in the country where gross domestic product fell in the second quarter. Ultra-low crop and livestock prices stemming from a global oversupply have squeezed farm incomes, pulling down Iowa’s GDP 0.7% and South Dakota’s 0.3% from the prior quarter. Sounds similar to the plight of oil producers. Oversupply hurts prices but there are those willing to make up for it on volume. Are you arguing that converting corn to fuel has no impact on corn prices? Just pointing out that there are other things that also affect prices does not refute the claim. I am pointing out association is not causation. Malthus and Ehrlich also did not consider the effects of a catastrophic CMEs or strategic nuclear EMP attacks on the complicated and delicate transportation and communications infrastructure that makes modern food production and distribution almost efficient enough to support the current world population. We have no protection against the effects of either. And a nuclear EMP attack would be the most effective use of a limited nuclear arsenal. We do have protection for any kind of attack. It will be swift and it does not necessarily have to be nuclear. About every 18 months we demonstrated with military exercises that ability. Any kind of attack? So we can deter the sun from sending a massive CME our way? That’s very reassuring. ” humans would foolishly burn their food ” Oh come on, when this Malthusian crap will stop appearing even in anti-mathusian piece. I surely IS foolish to pay for having them burned, but it is NOT food, just an industrial agricultural product. Farmers surely would have it turned to food if they could, they could sell at higher price, but the fact is, they cannot, just because nobody need it as food. The World Bank argument, which I agree with, is that fields use to grow corn for ethanol production, would be used to grow sweet corn for food or fodder, if there were no market for ethanol. This “field switch” would then lower the price for edible corn. Ethanol as fuel is bad — it is less energy dense than gasoline and is also water loving — so it ruins engines. Biodiesel from algae is a much better idea. It was painful to read because it was so poorly written. I was closely watching the debate on the energy bill on the internet when a mushroom cloud rose over the Pentagon. It was 9/11/01! What is really cool about the internet. You can get information from the source. So Andy you are writing a essays about human influence on the environment. Do you have any training or experience in energy and the environment? Retired Kit P, I was a petrophysicist in the energy industry for 42 years. Entirely self-taught on environmental science. The ethanol mandate requires the oil and gas industry to purchase a fixed amount of ethanol each year, whether they can use it or not. If they do not buy it, the customer is punished. That clearly qualifies those who voted for it to be called idiots. The mandate itself is the height of idiocy. Just my opinion. Also my opinion, the World Bank and IER are very credible sources of information. You have a different opinion, which is fine.